I came across 2 Colombia Barranquilla stamps that are unlisted and appear to be some sort of local label or local charity / tax stamp of some kind. Both are denominated 1/2c and share a common center design with different inscriptions. 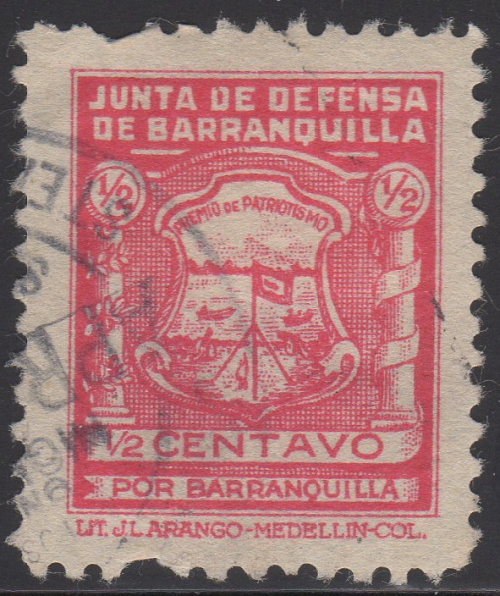 This first stamp is inscribed “Junta de Defensa de Barranquilla”, which, according to Google Translate reads: “Barranquilla Defense Board”. His death was influenced more determined to fight for the opening of Bocas de Ceniza creating the defense of Barranquilla Board convened in order to assume a more resolute attitude on the issue of Bocas de Ceniza devoting a souvenir in memory of the victims of air crash “Tolima” as it was called the aircraft. Su muerte influyo para que fuera mas decidida la lucha por la apertura de Bocas de Ceniza creándose la Junta de defensa de Barranquilla convocada con el fin de asumir una actitud mas resuelta sobre el problema de Bocas de Ceniza consagrando un recuerdo en memoria de las víctimas del accidente aéreo del “Tolima” como se llamaba la aeronave. 4. The shading is slightly different throughout. As with the first issue, I have not found hardly a thing on the internet relating to the Beautification Committee of Barranquilla. Other than an SCF Post with little information and a brief mention on this page, which (in Spanish), seems to have been written by someone who is mad about something. Anyway, it mentions a film that was screened as some benefit to the Beautification Committee and Public Improvements of Barranquilla as stated in a newspaper article from June 26th 1918. When were these stamps printed? Hard to say really, but I do have a clearer postmarked example, along with some covers. The postmark on this one shows the year as 1927 with the month illegible. In my hunt for information on these Cinderellas, I happened upon an auction for 3 covers bearing the “Defense Board” stamp which were all Paquebot covers to the USA. 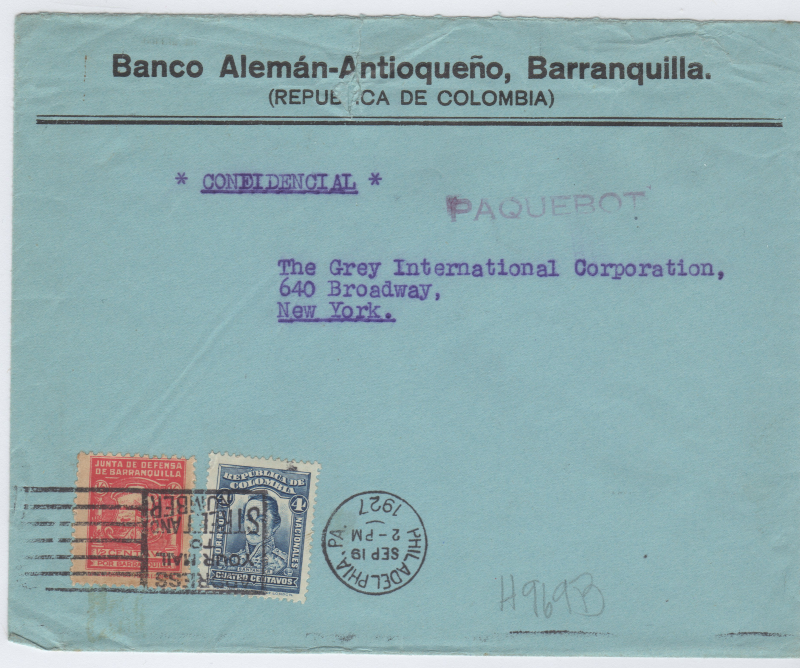 The earliest cover is postmarked in the US on September 19th, 1927 so the stamp was printed sometime before then. My limited understanding of Paquebot covers is that the letters were stamped and given to the ships purser on it’s voyage to wherever it was going. Once at its destination, the mail would then be cancelled and sent off. 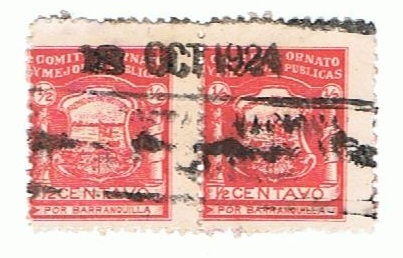 This cover was sent from “Banco Alemán Antioqueño” in Barranquilla. Antioquia is one of the 32 departments (e.g. states) of Colombia. It was marked confidential and sent to “The Grey International Corporation” in New York. This second cover, sent to the same Grey International Corporation from the same bank as before but in Medellin. 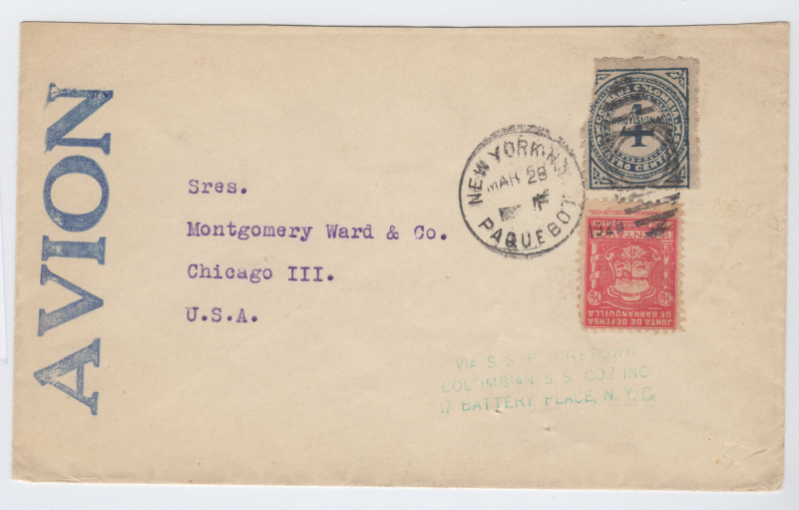 Paquebot Cover -Containing Scott #396 – Sent to Montgomery Ward in Chicago via New York. Contains no return address. 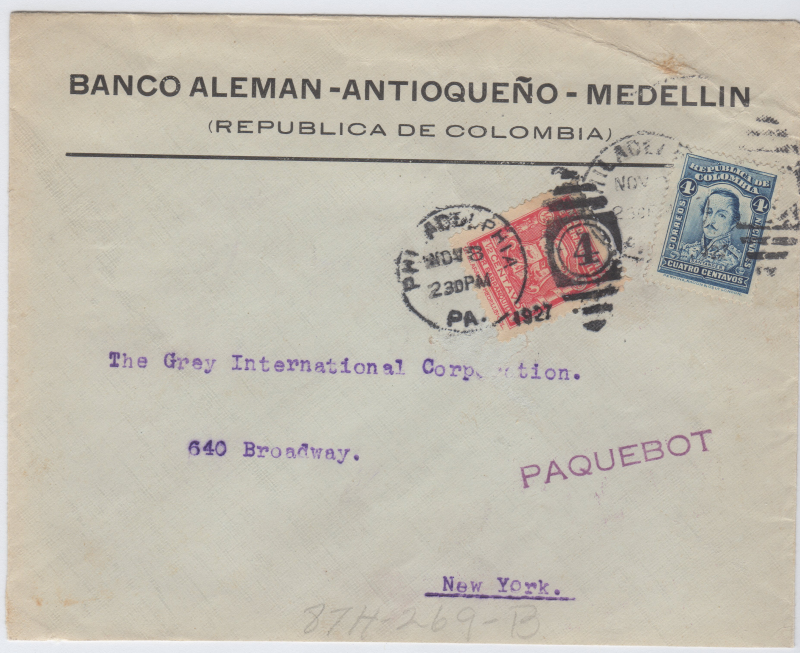 This stamp shows that the cover was sent via the S.S. Bridgetown owned by the Colombian Steamship Company in Battery Place, NYC. The Colombian Steamship Co., New York was then formed to operate a route from New York to Puerto Colombia, Cartagena and later to Haiti. The service expanded to the Leeward and Windward Islands and later to Brazil and other U.S. East Coast ports. Interestingly it doesn’t mention Barranquilla, at least on this site. 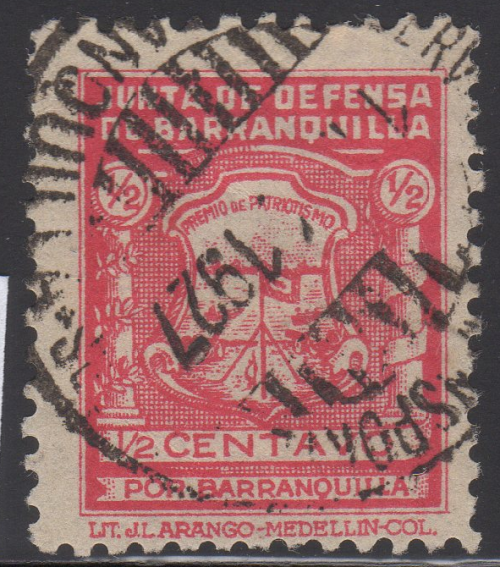 I have seen at least 2 or 3 other Barranquilla “Paquebot” covers on eBay and Delcampe. They almost feel like they were sort of “manufactured” but it is hard to say. If they postmarks are real then the person creating these covers did go through quite a bit of work. Cinderellas like these sometimes are a bigger mystery than “official” postage stamps. There is not always alot of information out there, and it is a challenge to dig up what you can. Update 12/16/2017 – In addition to the Beautification issue above, with a 1924 date, a fellow collector provided the cancelled pair as well, also showing a 1924 date. This should give us good evidence that this Beautification issue came out at least in 1924. 3 years prior to the Defense issue. I can’t imagine how or where you found the information on the Baranquilla stamp, but thank you for your effort, and HURRAY for the internet. That stamp would have driven me crazy, especially as it is postally used. Thank you. One year and a day and I am lookihg at this page searching for the same info on this stamp, sadly havent gotten any further than you….. BUT my stamp has a clear date of the 18 Occober 1924….. so any more infornation would be greatly appreciated. So nearly another year on and I had totally forgotten about this pair of stamps until I found them in a drawer….. So Eric if you are still interested in seeing a scan of them can you please tell me how??? cant seem to figure it out although its probably simple. My pleasure and I am glad you could open it and it is of some use… It throws a little bit more light on these cinderellas. Found the first example pictured, and figured it was a Revenue or a Local. 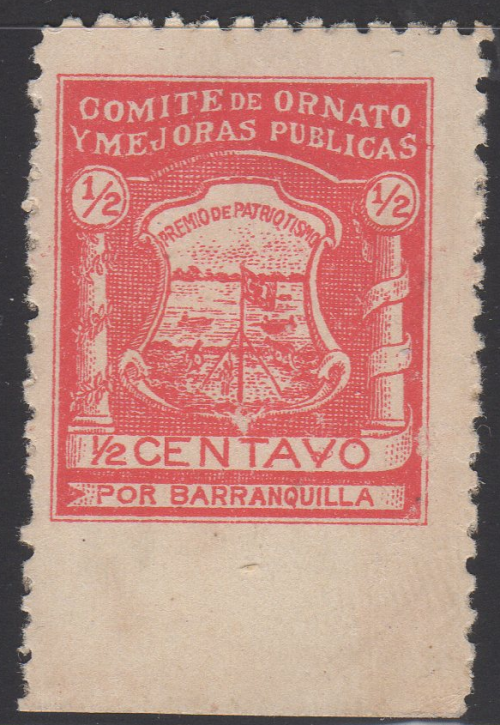 Funny, it was hinged in the Spain pages of a feeder album I purchased, but I knew that Barranquilla was in Columbia! Couldn’t find it in Scott’s, and googled “defensa de barranquilla” and found your website. I’ll take a longer look at your site, and THANK YOU for publishing, as these blogs are just wonderful resources for other collectors– have been collecting the world 1840-1940, in Scott Volume 1, only from finding Jim Jackson’s “Big Blue” blog a couple of years ago. Prior to this, I’ve been a US specialist for several years now with plating the 1851-7 1c stamp and collecting the shades of the 1861 3c.